Trail Work Days will be posted here as they are scheduled. Are you curious about what we do and who we are? This is a great opportunity to find out and get involved; everyone is welcome. No experience is necessary to participate in a Trail Day, just a desire to make our trails better. Wear clothes for working outdoors (long sleeves, pants, gloves, boots, eye protection) and bring something to drink. We’ll provide the tools, but you are more than welcome to bring your own. We look forward to seeing you at one of our upcoming Trail Work Days! UPDATE: This trail day has been cancelled due to inclement weather. 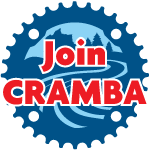 Join CRAMBA for trail work days at Stony Creek Metropark. Meet at the West Branch / Shelden Trails area, lot B. Main focus of the trail work is to help mitigate the effects of erosion and general wear and tear on the trail surface, striving to returning the trail surface to it's original condition. Additional projects will be identified and tackled as needed. Bring appropriate clothing and supplies for a day of working in the woods: long sleeves and pants, boots, gloves, water, and snacks (if needed). Tools will be on hand, but if you personally have hand tools that you prfer (rakes, shovels, loppers) please bring them. Meet at main trailhead for trail work day. See https://miscabike.org/event/2019-addison/ for more information. See https://miscabike.org/event/2019-river-bends/ for more information. See https://miscabike.org/event/2019-bloomer-park/ for more information.